Daily Spirit & Word: 695: Letters to the Churches. Good morning my friends, after Sunday comes Monday. Do you sometimes get those Monday Morning Blues? You know the feeling, the weekend has been great, but it is over and it’s back to work as usual. Sometimes life can become repetitive and mundane. We’ve got the endless rounds of politics, elections, and horrible slandering of politicians in the News. European exit or stay campaigning. Who to believe? Perhaps we’re hungering for something new, something bright, something cheery, some really great NEWS to burst forth into our lives, news that will make the whole world so happy that they’ll just stop in their tracks and get along with one another and seek the common good of everyone. Imagine a world like that, a world without war and rumours of war. A world without disasters or disease or even death. Imagine a world where people really did love and care for each other. Wouldn’t that be outstanding? What would it take for the world to become more like the way the LORD Created it to be? Of course we do see glimmers of it, real kindness and care from people who don’t hog the limelight. Generous people who give so much of their time and talents to a world that doesn’t even care or notice. Even in the face of blatant ingratitude, there are people who don’t even seem to count the cost to themselves and just keep on giving and giving. My wife’s a bit like that, I’m just so blessed to have a wonderful woman who really knows how to LOVE and not count the cost. Perhaps one day, like the man who was recognised many years after the war for his efforts to get hundreds of Jewish children over to the UK from Europe, away from the threats of Nazi death camps. That story made so many people cry with his selfless dedication and the risks that he took to SAVE those children. I think what moved us all was the children and grandchildren of the ones he’d saved, because without him none of them would be around today. Yes my friends there are glimmers of real HOPE in the world today. As we reflect upon Jesus’ Letters to the Churches in early first century of Christianity, can you imagine what it must have been like for them receiving a letter from Jesus Christ? I’m also wondering what Jesus would say to me. What would he say to you? What would He say to your Church or your leadership? Let’s take a little sneaky-peak into what Jesus wanted to say to those first Christians living in Asia all those years ago. Revelation 2:1-7 (NIV) Jesus Message to the Christians in Ephesus. 6 But you have this in your favour: You hate the practices of the Nicolaitans, which I also hate. Do you remember what the Seven Stars and Seven Lampstands represented? (See the end of Chapter 1 of Revelation). My friends, Jesus is walking amongst those churches, their leaders and every Christian. He’s not stopped walking amongst us also. Nothing is hidden from His sight. Nothing in all Creation. He knows everything. Jesus reveals to John that He KNOWS all about those brothers and sisters in Ephesus. Testing the Apostles, to see who’s true or false (We hate it if someone calls someone a ‘false prophet or false convert’ today don’t we, but right judgement of people is obviously a very high priority for our Heavenly Enthroned Risen and Alive Lord Jesus Christ.). Enduring hardships because of Jesus Name (The Christians in Ephesus were persecuted terribly in the first century). But they didn’t grow weary because of it. Jesus really does KNOW these brothers and sisters in Ephesus. They have a great deal to commend and encourage. 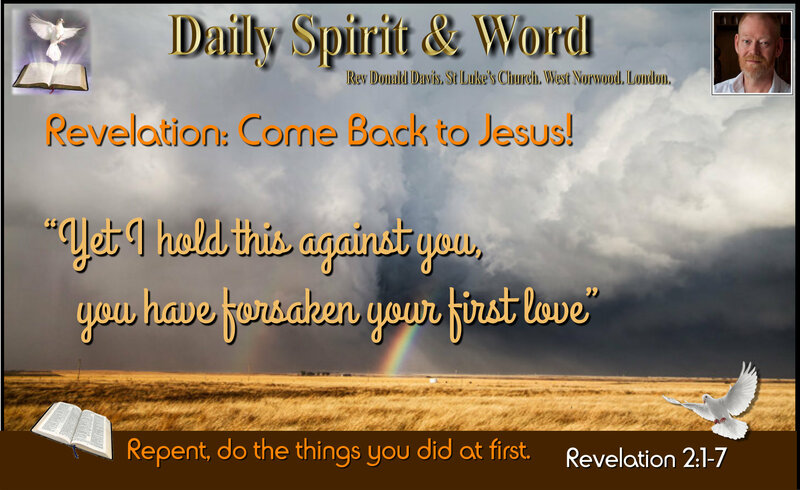 However, Jesus goes onto remind them of something critical to their walk with Him: They had forsaken their first LOVE! i.e. their DEVOTION to HIM as LORD. How had they done that? Jesus doesn’t go into the details, isn’t that so like Jesus, He knows but he’s not telling anybody how they’ve fallen, but the fact that He knows they have would have hit them so powerfully, because it’s obvious from everything else that Jesus says that once the really did love Him with all their hearts. Imagine getting a letter from Jesus today and He said that about you? You are very religious, you do great works, you even persevere under great trials, but you have FORSAKEN Me… oH WOWzer! How convicting, how terrible… Could it really be true that we can be all those things and yet not be walking with Jesus? Have you stopped to consider the gentle and compassionate way that Jesus reveals their spiritual condition and the danger they are in unless they turn once again to Him in true repentance? He first Commends them with a deep knowledge of their TRIUMPHS, then rebukes them for their FAILINGS, then Encourages them once again for their practical righteousness. Now all they need to do is TURN back to Him and He’s promising them amazing rewards; access to the Tree of Life. “I have this against you, you have forsaken your first love”. Just as a married couple can be shown how to re-kindle their passionate love for one another, by getting them in touch with the feeling they once felt for on another at the beginning of their relationship. So Lord Jesus is calling the Ephesian Christians to come back to their FIRST LOVE. He’s encouraging them to REMEMBER. “Remember the height from which you have fallen.” The Christians is Ephesus were once so on fire with Love for Jesus they were ready to give their lives in His service. What happens when we forsake Jesus? Our passion for close communion with Him slowly dies. You see my friends, we serve a RISEN Saviour, He’s in the world today, I know that He is LIVING whatever men may say, He’s right beside me, He’s inside me, He’s closer than a brother, He’s kinder than the Auntie who loved you no matter what you did. Jesus wants you back. He wants you to LOVE Him more than anything else in this world. Sometimes, we Forsake Jesus, because other loves creep into our lives, then slowly but surely we find that we’re not as passionate or on fire about Jesus or His desires or His likes or His wishes. He’s calling YOU back to Himself. Keep going with the great things you are doing for Jesus, but LOVE Him first, the REWARDS will far exceed any sacrifice you have to make when you forsake this world and the pleasures it offers. Have an awesome week with Jesus. Previous PostPrevious Believe In The Kingdom POWER of God’s Word.